Home Software Technology Jawoco Officially Released Xtravo 6.3! Jawoco Officially Released Xtravo 6.3! 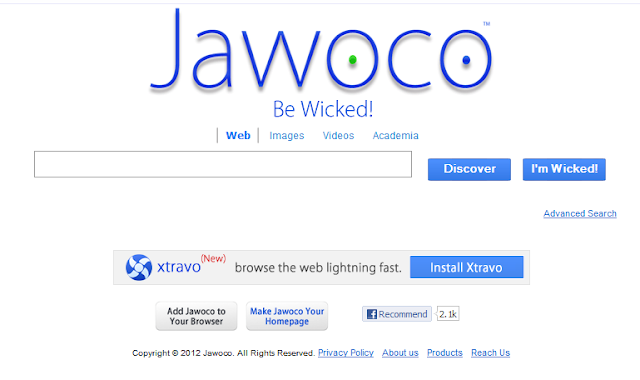 Finally, last June 3, 2012, the much awaited version Xtravo 6.3 has been released by Jawoco, “the search wicked engine” as tag by itself which runs the newest simple browser in the market called Xtravo, a trident and tetrapod technology -based browser. (read my previous post about xtravo). According to the press release, Xtravo's new version offers new user experience plus a facelift to it's user interface. Xtravo 6.3 UI has been voted as the "World's Most Simple UI," according to Jawoco's recent survey conducted on May 1st 2012. UI consist of simple web browser controls, as seen on other web browsers but more light on the eyes. More significantly, the version 6.3 has reduced 70% internal bugs and 4 times more improved under the hood compared to its predecessors. Innovative features added such as Trident engine 6.0 support in rendering which supports modern web standards like HTML5, CSS3, SVG, ES5 and more. It will automatically shift to compatibility mode according to the website, if it is supporting old web standards. In the interface improvement,one of the most anticipated feature is the "Acid Address Bar" which lets users directly land on the right website if a search query is entered. Feature list includes new menu control, auto-update feature, Cococ engine 3 for web apps and much more. I said it partial, because I have no stable internet connection to test the actual browser speed. My overview is on its UI and some of its new features. -It can play a video smoothly on Youtube however, the search autofill seems don't work properly. For example, when you enter” Jason Chen -It was just a...” it will actually suggest or show similar titles but when you click on the suggestion it has no action. -When navigating around tabs it has no hover effects thus, you will be thinking that it's unresponsive especially when you open different pages on the same site. -In some websites I have tried to browse using Xtravo 6.3, I have noticed that the mouse scroll don't work though so you'll need to manually scroll. - I think xtravo will remain its simple look so, as of now there's no themes available for users. - Xtravo claims that its Cococ engine 3 support for web apps is much better than Mozilla but I don't see or find any web apps for xtravo either. Maybe in the future. Well, the acid bar and the Wicked button is simply a tool to get directly into the desired site without further typing the whole domain name. In the example, when typing Facebook IPO, you will directed to CNBC News Source Website or let say you will type “yugatech or yoga, then xtravo will show the "yugatech.com" website. I have observed that this only works efficiently on unique domains. For example if I will type “bennixville” it will goes to "bennixville.com" not on with .net extensions so you need to narrow your search a little bit. Overall, this feature is unique & fantastic. Though I found a bits of cons on this version, I am still a fan of xtravo because I simply love its simplicity and I am looking forward of more under the hood improvements.